This entry was posted in 2017, Spain and tagged 2017, Khalili Research Centre, Medieval, Oxford, ql-Andalus, Spain on April 30, 2017 by Clare Hills-Nova. Attendance Free: Link here to book your place. This entry was posted in 2017, Spain and tagged 2017, Golden Haggadah, Hebrew manuscripts, John Coffin Lecture, Medieval, Spain on April 29, 2017 by Clare Hills-Nova. This entry was posted in 2017, Conference, Middle Ages, Princeton and tagged 2017, Index of Christian Art, Medieval, Middle Ages, Princeton on March 5, 2017 by Clare Hills-Nova. La caiguda de Jerusalem en 1187 i la pèrdua d’Atenes pels catalans en 1388 marquen dos segles convulsos de moviment i expansió dels diferents estats llatins del Mediterrani que propiciaren com mai la mobilitat i transferència artística entre llatins, grecs, musulmans i cristians orientals. Tant la “protecció” i la peregrinació als Llocs Sants com la creació de noves rutes d’expansió militar i comercial portaren la Corona Catalano-Aragonesa a ciutats com Venècia, Pisa o Gènova, a afavorir diferents processos d’apropiació del sagrat, a l’adquisició de botins de guerra, o a l’intercanvi de regals de significació político-dinàstica o diplomàtica. Es tracta d’un intercanvi que va en dues direccions, i que propicià interesants processos d’aculturació i introjecció artística fins ara no suficientment explorats per la historiografia i que han de ser entesos dins del paradigma d’una Global Middle Ages. Projecte de recerca Movilidad y transferencia artística en el Mediterráneo medieval (1187-1388): artistas, objetos y modelos. MAGISTRI MEDITERRANEI (MICINN HAR2015-63883-P) de la Universitat Autònoma de Barcelona. This entry was posted in 2017, Middle Ages, Spain and tagged 2017, Magistri Mediterranei, Medieval, Medieval Mediterranean, Middle Ages, Spain on February 18, 2017 by Clare Hills-Nova. This entry was posted in 2017, Conference, Spain, Spanish Art and tagged 2017, Architecture, Catalonia, Magistri Cataloniae, Medieval, Spain, Spanish Art on February 18, 2017 by Clare Hills-Nova. The exhibition brings together an exceptional group of fourteen works that were removed in the past from their original location (the west façade and choir of the Cathedral in Santiago de Compostela) and are now housed in the cathedral museum and in different institutions and private collections. Notable among them are the recently restored sculptures of David and Solomon, and a Statue-column of a male figure holding a cartouche that was found last October inside the cathedral’s south tower, a discovery that represents an enormous advance in our knowledge of Master Mateo’s activities in the cathedral of Santiago de Compostela. Co-organised with the Real Academia Gallega de Bellas Artes, and the Fundación Catedral de Santiago. This entry was posted in 2017, Exhibition, Madrid, Prado, Sculpture, Spanish Art and tagged 2016, 2017, Madrid, Master Mteo, Medieval, Prado, Santiago de Compostela, Sculpture, Spanish Art on November 29, 2016 by Clare Hills-Nova. 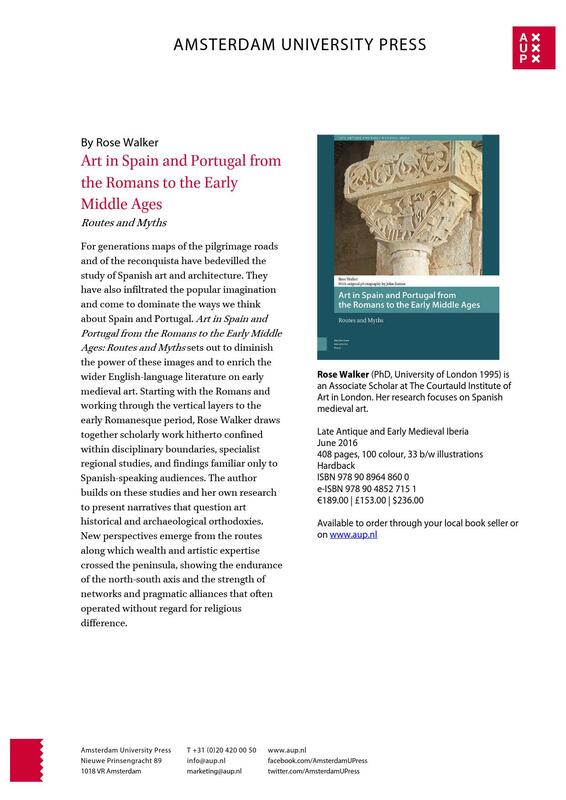 ARTES member Dr Rose Walker of the Courtauld Institute of Art has recently launched her latest book on early art in the Iberian Peninsula. A discount is available to those ARTES members who would like to buy a copy. Please contact artesiberia@gmail.com for details. This entry was posted in ARTES, Middle Ages and tagged Artes, London, Medieval, Medieval, Middle Ages, Rose Walker, Spain on November 2, 2016 by M. Ellis.